After extensive tests, I just remember the words “you are going to go blind.” My world just shattered, the room spun and I just had to get out of there. When I was first diagnosed with Retinitis Pigmentosa (RP) at the age of 19 was a very pivotal point in my life. I was already studying at art college and had just been offered a university place on a figurative sculpture degree course. With only 28 offers in Europe, was one of those 28. After extensive tests, I just remember the words “you are going to go blind.” My world just shattered, the room spun and I just had to get out of there. I drove home and dropped off my mum and then drove off. Ending up on the beach, I sat on the end of the jetty. The sky was grey and the wind was howling, I just cried, and thought the tears would never stop. That was 24 years ago and my sight loss has taken me on one heck of a journey. I was registered legally blind back in 2002. Currently, I have between 3-5% residual vision, this is hand movement in the left eye and shapes and light in the right. Although I had to walk away from university I could not deny that sculpture was in my veins. After taking some time to adjust to my new circumstances, picked up a chisel and mallet and begin creating. This was really for therapeutic reasons at first but then I began to put my work into local galleries. In a short amount of time, I was gaining private commission work. Since then my work has gone from strength to strength. I’ve worked in teaching for many years and this was a nice way to diversify my artistic skills and share them with others. My personal epiphany with my attitude towards my sight loss came only 3 and a half years ago. I had always dodged the need to use a long cane. For years organizations tried to introduce me to using a cane without success. Then about 5 years ago I had a very big wake up call. I was out walking my little Westie dog. It was November and the autumn sun was very low in the morning sky. I had on my sunglasses but it was very difficult to see and I misjudged a left turn. Instead of turning onto the pathway leading to the park, I fell 6ft into a culvert. The fall damaged my right knee severely, tearing my inside medial ligament. It was extremely painful and I could not walk and it took 3 months to properly heal. This was when I decided I could no longer keep on struggling without a mobility aid. Initially, I thought perhaps I needed a Guide dog so I contacted my local Guide Dogs Association. After some initial training, I had to stop my application, when we realized our Westie would never let another dog in the house! So there was no other option for me than to bite the bullet and learn how to use the long cane. After 3 months of long cane training with my incredible trainer, I passed and became a proficient cane user. I now have gone from a cane hater to a cane lover, owning 4 long canes including my faithful purple one and a bamboo one that I created myself. Self-development has played a very important part in my acceptance of my sight loss. I worked very hard with my holistic counselor. For nearly 4 years we worked on my self-worth, learning how to love myself, and embracing every part of myself. It’s been the most wonderful journey, connecting on a spiritual level feeds me with all I need. This is the very reason why I am where I am today, through an acceptance of who I really am and a love of all my imperfections. It is truly a beautiful lesson, and I look forward to all the future lessons ahead. I am happily married to my husband, who is an incredible support, he has such a positive outlook on life and helps me find solutions to how I can continue breaking boundaries. My parents have always been there for me, providing practical help and support throughout this journey. My work has been my source of connection to my inner self. It has seen me through some very tough times and has brought me the success I now enjoy today. My work is symbolic, based on form and shape and I use piercings in many of my pieces–I create my sculpture from wood and I like to suspend gemstones. I have exhibited all over the South East of the UK, including central London, the Houses Of Parliament and America Square. Also, I have been featured by the BBC and in many national magazines; my work is owned internationally. A national gallery is reviewing my Blind A Sixth Sense exhibition for inclusion in their exhibition programme for 2020-2021. This exhibition explored a unique concept of placing 6 sculpted pieces depicting the senses into a pitch black gallery space. The public was invited to interpret the work by using their other senses. This was an incredible success seeing over 500 people visit the exhibition and a sell out on work. As an Ambassador for the national charity Retina UK, I advocate the work of the charity. This includes social media, public speaking and offering support to those newly diagnosed with RP. This advocacy work is very dear to my heart. 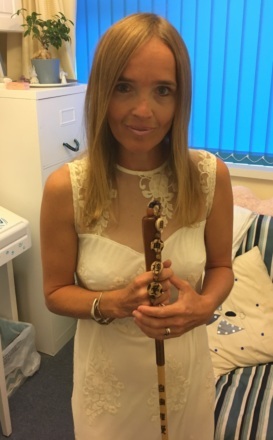 I want to offer help to those who may be struggling with their sight loss by helping them navigate their own pathway through this very life-changing time. I share my experience of sight loss through public speaking, exhibiting my work and will be writing my memoirs later this year. I’m also designing a new website which will act as a central hub for those with sight loss. It will be a place where the blind and VI community can connect, share stories, and support one another. The website will also highlight all of my activities, including my career as a professional sculptor, public speaking and my Ambassador work. I will share all of my other loves, this includes surfing, something that I learnt only 4 years ago. Surfing is one of the most freeing activities I’ve ever done. There are no obstacles in the ocean and the feeling of connection to the force of mother nature as you ride a wave is just incredible. I’m also a keen skateboarder, and again, like surfing it gives me such a sense of freedom. I use my long cane out in front of me in my left hand, this helps me navigate. I am learning to snowboard too, I think the board sports give me such joy. I’ve been a musician for over 20 years, singing and playing in many bands as well as solo work. I love to write new material on my piano, it’s a beautiful form of expression. I feel so very blessed to have found a sense of freedom within the acceptance of my sight loss. This acceptance has shown me the beauty within blindness–a sense of stillness, a sensory experience that you cannot gain when sighted. A connection to one’s own trust, this trust is what will open you to all possibilities. I have learnt that blindness is not to be feared, it is to be embraced wholeheartedly, through acceptance, adaptivity, and accessibility. You can live a life that is full, joyous, successful and incredibly meaningful, with limitless potential. In this photo, Victoria is stunning as she stands facing the camera with her bamboo long cane. She is wearing a beautiful cream lace dress and her straight blond hair frames her face. Victoria & The Guardian. In this photo, Victoria, in a purple sleeveless sheath dress and matching long cane is posing with her sculpture, The Guardian. The Guardian is a wooden sculpture of a vertical wing. The photo was taken at the FLY Freedom In Acceptance exhibition in central London. Shaded of Lillies is a lovely wooden tactile tabletop delight. Three graceful flowers, from light to dark shades stand atop a light wooden base. The slender stems of the flowers ever so slightly bend upward to the floral base which resembles raised cupped hands. Surf, Sand And Spirit. This piece depicts a symbolic upright surfboard with an amber suspension hanging from the piercing. The base represents the ripples that form in wet sand, this piece is created from alder wood and oak wood. Victoria Surfing: An action shot of Victoria riding a wave on her surfboard in a wetsuit. Musical Artist, Naomie Inas, was recently featured here on Bold Blind Beauty as a Woman On The Move. A talented woman dedicated to her craft, she is pursuing her dreams and is an excellent role model. Naomie exemplifies what a person can do when their passion takes center stage. Featured image is a faux fashion magazine cover titled Blind Beauty. Naomie is on the cover and she has a certain je né sais quoi that makes her look like a star. Fashionably elegant and sporting a blond bob, she is wearing an open cropped jacket with a fur-trimmed collar. In muted shades of brown, her outfit includes a bra with a coordinating skirt and a long pendant necklace. She is standing with her left hand against a red brick wall. ~Becky Peterson Andrews, (quote is an excerpt from chapter 7 of her book). Becky is the author of the book, Look up, move forward: My journey of losing vision and finding resilience. In the book, she shares the story of her blinding retinal disease and how she is able to live a resilient lifestyle. Practicing what she preaches, Becky is an excellent role model who has run in the Boston Marathon several times. 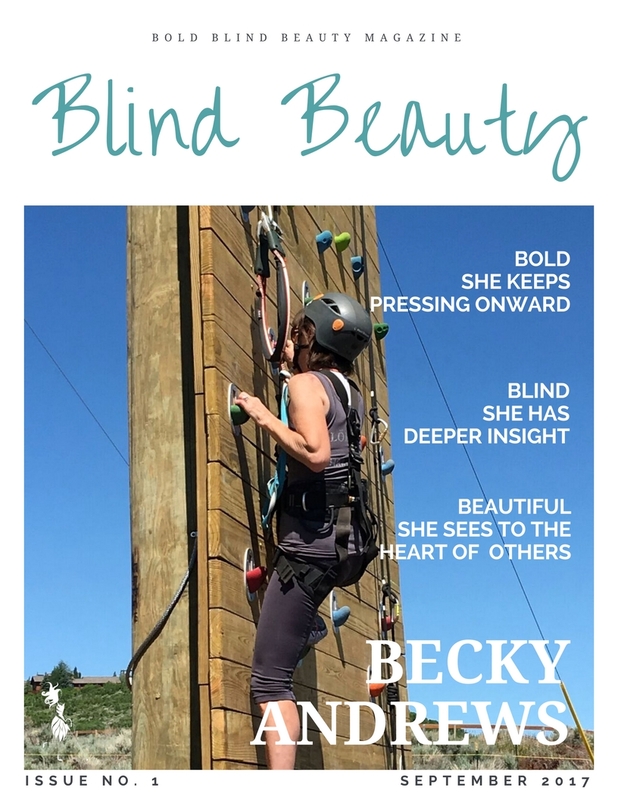 Dedicated to helping others become more resilient Becky hosts annual retreats for women who are blind or visually impaired. Featured image is a mock magazine cover titled Blind Beauty. Becky Andrews is on the cover in a safety harness and helmet climbing a rock wall. The following article was lightly edited and updated. Our featured Woman On The Move is someone I’ve only met virtually by conference calls, email, and phone. Empish and I serve as Peer Advisors for VisionAware and in this role, we offer advice and helpful tips to those new to sight loss. Empish is a prolific writer, advocate, and mentor. She has also been an invaluable resource to me and a voice for blind and visually impaired people. My journey as a visually impaired writer started about 20 years ago. After finishing my rehabilitation training at the Center for the Visually Impaired (CVI), I volunteered to write and edit their newsletter. Eventually, the volunteer opportunity blossomed into a paid position. In this new role, I provided information and resources to people with disabilities. Simultaneously I worked part-time as an AmeriCorps member providing peer support and advocacy. Later, I launched my freelance writing career with an emphasis on the disabled and landed a column in Dialogue Magazine. I wrote career profiles on people who are visually impaired as a direct result of my passion and journalism experience. In each issue, I profiled people successfully working in a variety of career fields from education, government, science, self-employment, arts, and entertainment. And if all of this was not enough I volunteer in the blind community as well! I am a peer advisor and blogger for VisionAware. On this site, I lend my professional and personal experience to people experiencing vision loss. I’ve volunteered with the American Foundation for the Blind’s Career Connect. Here I interacted via e-mail with others interested in pursuing a journalism career. Previously, I was a volunteer producer for a monthly hour radio show for the blind called “Eye on Blindness.” The show was sponsored by the Georgia area Radio Reading Service (GaRRS). It was an interview-style program which featured special guests who provided information on a variety of topics such as travel, employment, health, and politics. I am proud that I’ve been able to take my education, disability, work, and life experiences, and combined them. Not only do I have a rewarding and meaningful life but a fantastic career that I absolutely love! 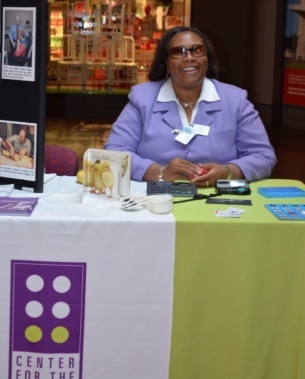 Empish Thomas is seated at CVI Exhibit Table at Coca-Cola’s Disability and Diversity Awareness Fair.